10 year old Uriel Wang, who is battling rare form of leukemia, scores touchdown during halftime of Israel Football League game. Uriel Wang, a 10 year old from Jerusalem who is battling a rare form of leukemia ordinarily found only in adults, has relapsed 4 times in the past 2 years. 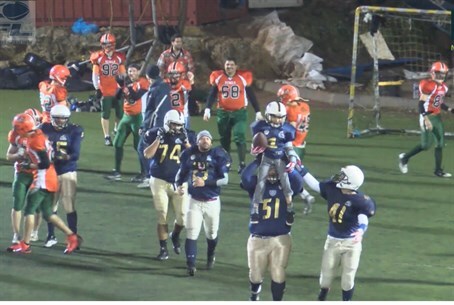 To honor his fighting spirit, he was invited to score a touchdown during halftime at an Israel (American) Football League game on December 5. After arriving at Jerusalem's Kraft Stadium, Uriel was given padding, a helmet, and a special #1 team jersey with his name on it. During halftime, the Jerusalem Lions and their rivals, the Judean Rebels, took the field and ran a play in which Uriel ran for a touchdown. Uriel underwent his second bone marrow transplant in May after a long search for a donor match. He is currently back home, regaining his strength and continuing his fight with leukemia. Uriel's Chinese, American and Yemenite heritage, along with a chromosome abnormality, have made it difficult to find a bone marrow match. For ways to donate and help Uriel in his struggle with cancer, click here. The game was the first of the season for both the Lions and the Rebels. Danny Brill, manager of the Lions, contacted Uriel's family after seeing his website, asking how he could help, after which the halftime touchdown was proposed.